In his first week in office, Gov. Gavin Newsom sent a strong warning to cities and counties: He was coming for their road repair dollars if they didn’t meet state goals for new housing. “If you’re not hitting your goals, I don’t know why you get the money,” Newsom said when he announced his budget plans in January. California’s newly elected governor, Gavin Newsom, gave his first “state of the state” address on February 12, and it was a speech more noteworthy for what he didn’t than for what he did mention. Were Newsom’s sins of omission the conscious choice of a seasoned politician, or is he in denial, like so many of his California leftist cohorts? Before criticizing the content, and the omissions, of Newsom’s speech, it’s necessary to make something clear: Nobody can deny California’s accomplishments; its great universities; its vibrant, diverse industries; its global economic and cultural influence. But California’s accomplishments are in spite of its state government, not because of it. That cannot be emphasized enough. Newsom began by saying Californians had to make “tough calls” on the issues of transportation, water, energy, migrants, the homeless, healthcare, and the cost-of-living. He proceeded next to make no tough calls. With respect to transportation, Newsom made no mention of California’s crumbling, clogged freeways and connector roads. To be fair to Newsom, when you don’t have to commute day after day during rush hour — and even when you do drive, you have a driver so you can sit in the back seat of a very quiet, very smooth ride, and conduct teleconferences — you don’t really think about “roads” the same way the rest of us do. So understandably, Newsom chose to talk about high speed rail, and even on that topic, he hedged his bets. He proclaimed the project would cost too much and take too long to build a track from Sacramento all the way to San Diego, or even from San Francisco to Los Angeles. Instead he committed to focusing on completing the track from Merced to Bakersfield, where work has already begun. Is this denial? Or just the out-of-touch priorities of an extremely wealthy man who doesn’t have to drive? Merced? To Bakersfield? Along the entire 163 mile stretch between these two cities, including everyone living in all the five surrounding counties, there are only 2.8 million people. How much will that cost? $10 billion? $20 billion (more likely)? Has Newsom considered how much highway improvement could be done with all that money? For that matter, might we ask the voters of Fresno and Kern counties, as if all that money should be spent there — “would you rather have $20 billion spent on road improvements, or that train?” Or are we afraid of the answer? Does Gavin Newsom understand that even if high-speed rail were built in all its original scope, it would still do virtually nothing to ameliorate California’s transportation challenges, which can only be solved by building new roads and widening existing roads? On the issue of water, Newsom also split the difference on what promises to be California’s second biggest infrastructure money pit after high-speed rail. That would be the two proposed “delta tunnels” that would transport runoff from Northern California, under the Sacramento River Delta, and onward to thirsty farms and cities in arid Southern California. But the governor didn’t call for two tunnels, nor did he kill the project. Like Solomon, Newsom is going to give the “water fix” advocates half of their baby. He wants to build one tunnel. Newsom correctly stated that demand for water exceeds supply in California, but he was firmly in denial as to the solution, which is to create more supply. For the cost of even just one delta tunnel, massive desalination plants could be constructed on the Southern California coast. Those facilities, combined with runoff capture and sewage reuse projects throughout California’s coastal cities, could make them water independent. Seismic upgrades to levees along with new fish hatcheries could preserve cost-effective, environmentally acceptable movement of northern water to southern customers through the delta, something that’s worked for decades. And more storage via new off-stream reservoirs, aquifer recharge, and raising the Shasta Dam would supply additional millions of acre feet. Instead? A tunnel that will cost at least $20 billion, and add zero water to California’s annual supply. California’s politically sacred mission these days, of course, is to invite the migrants of the world to settle here. Newsom didn’t disappoint his crowd, trotting out dubious statistics to prove that undocumented immigration is a “manufactured problem.” But again, Newsom is denying the big picture: If California rolls out the welcome mat for the destitute masses of the world, where does it end? There’s good, accurate data available on this. More than 800 million people in the world live in extreme poverty — defined as living on less than two dollars per day. What about Latin Americans, who according to Newsom’s equally photogenic counterpart in the U.S. Congress, Alexandria Ocasio-Cortez (D-N.Y.), “must be exempt from immigration laws because they are ‘native’ to U.S. lands”? Over 150 million Latin Americans live on less than $4 per day. Hundreds of additional millions of Latin Americans struggle economically. Why not form “caravans” to bring them all here? Newsom, along with the entire California Legislature, will cheer them on and let them in, no matter what the cost. As it is, currently 2.6 million undocumented immigrants live in California. Even the liberal website politifact.com acknowledges that 55 percent of immigrant households in California benefit from welfare, with their only supposedly debunking caveat being that some of these households have U.S. born children. Other recent studies put the California total as high as 72 percent. There is a cost to Californians for all this, estimated as high as $25 billion per year, so where does Gov. Newsom draw the line? Three million more migrants? Five million? Ten million? One hundred million? Or is he in denial? And What About Those Politically Created Shortages? Newsom mentioned “overcrowded classrooms,” and talked about “too much demand, too little supply” for housing. But his solution for education was, what a surprise, more money and “accountability for all public schools, traditional and charters” (a slap at the charter schools, well received based on the applause from the union-controlled audience). Newsom remained in denial as to the real reason California’s public schools are failing, the fact that teaching professionals have been unionized, and the unions have used the dues revenue to exercise nearly absolute control over state and local politicians. Thanks to the teachers union, bipartisan reforms to union work rules (dismissal policies, layoff criteria, lengthened tenure) are watered down or completely squelched, and charter schools are under constant attack. As the old cornball adage goes, denial ain’t just a river in Egypt, Gov. Newsom. Public sector unions destroyed public education in California. Do something about that, if your thousand watt compassionate smile is doing anything more than hiding a vacuous brain, guiding a feckless, morally indifferent human, attracted to nothing more than publicity, power, money, and beautiful women. That’s probably an overly harsh, unfair and inaccurate assessment of the Governor. So maybe he will silence his skeptics, by doing something that takes actual courage. Take on the teachers union. Don’t talk about it. Fight them. Fight them tooth and nail. Fight them on the beaches. Fight them in the streets. Fight them in the hills. Never give up. Wasn’t Newsom’s campaign slogan “courage for change”? Offer that slogan, but nothing else, to the semi-literate, totally innumerate, thoroughly indoctrinated products of California’s public schools, and see how much good it does. They are the victims of the teachers unions. They need courage from the Governor. Not a pretty face. Not a pretty phrase. Newsom’s solution for the housing shortage, so far, is to sue cities and counties that won’t build government subsidized “affordable housing.” But “affordable housing” is never affordable, and everyone knows that by now. It’s just a money tree for connected developers. To make homes “affordable” doesn’t have to cost taxpayers a dime. Just deregulate the private housing industry, making it easier to develop land. Then, strip away the overreaching design mandates that turn ordinary homes and apartments into hermetically sealed, stupefyingly expensive, miniature Borg cubes with embedded, connected chips in everything from the toilets to the coffeemaker, festooned with phony “gingerbread” eaves and trim that some marketing department tested with focus groups. Newsom, to his credit, did mention the need to modify the California Environmental Quality Act (CEQA), an absurdly intrusive law that is a gold mine for trial lawyers and unions who use it to stop land development in its tracks. But his solution? Turning CEQA reform over to a task force consisting of union officials and large home developers. Newsflash, Gov. Newsom! Union officials and large home developers won’t benefit from CEQA reform, so they won’t come up with anything useful. They like CEQA just the way it is. Because CEQA is the reason the median home price in California is $547,400. That is an absolutely obscene amount for anyone to have to pay for a home. But it further enriches the billionaire land developers who have the political clout and financial heft to withstand the avalanche of CEQA lawsuits and regulatory hurdles. Who is harmed by CEQA? The average Joe who owns ten acres and knows a building contractor. Those guys can only dream of meaningful CEQA reform. Better yet, they should move to Texas which is still open for business. Or, that is, move to Texas before Gov. Newsom’s other photogenic counterpart, “Beto,” and his gang of Leftists with a twang, manage to turn that state into another California. On every topic, Newsom’s theme was at least consistent. Let’s be tough, let’s be honest, let’s do our duty to ALL Californians. But he wasn’t tough, and he wasn’t honestly choosing the right questions to ask, so it’s hard to see how he was doing his duty to all Californians. And for a man leading the biggest state in the United States, who could very well end up being inaugurated as the next U.S. President in January 2024, we need more. Much more. Here are three topics of bipartisan urgency that Newsom should have, but didn’t touch. He didn’t talk about how on the next economic downturn, state and local public employee pensions are poised to bankrupt half of California’s cities and counties and totally blow up the state budget. He didn’t talk about how California’s public employee unions have formed a coalition with extreme environmentalists and Leftist billionaires to stop all development of land and energy in order to create an asset bubble that benefits public coffers and private investments while screwing everyone else. He didn’t talk about how, even if you believe all the alarmist hyperbole regarding climate change, you can’t possibly go “carbon free” without more hydro-electric and nuclear power. Newsom’s mannerisms might remind one of Chris Collinsworth, a tall and well-liked sportscaster who talks with a perpetual smile on his face. But Newsom isn’t a sportscaster. He’s presiding over a state — with 40 million people and “the fifth largest economy on earth” — that has been taken over by a gang of money grubbing, power-mad, opportunistic, platitude-spewing con artists. If Newsom’s intentions are half as benevolent as that compassionate smile of his tells us they are, and if his “courage for change” is sincere, then here’s another way he can redeem himself in the eyes of his skeptics. He can live the life that his political comrades have imposed on California’s hardest working residents. Instead of moving into a 12,000-square-foot mansion, located on an eight acre compound in one of the wealthiest ZIP codes in Sacramento County, Newsom should move his family into one of those California median priced $547,400 homes, situated on a 3,200 square foot lot, surrounded by other homes on 3,200-square-foot lots, and send his four children to a public school. Redemption is good for the soul, so there’s more: for Newsom to fully live the California dream, and prove he cares about “ALL Californians,” he should give his personal wealth away to charity — or better yet, send it to the CalPERS public employee pension fund because they’re going after every dime they can get their hands on. Then, Newsom should cut his governor’s pay to $71,805, which is California’s median household income, and refuse all outside honorariums and fees. And he should do this not for two weeks to make a statement, or even for the next four years. He should do this for the rest of his life. He would be in denial no longer. California cities top list of towns with worst roads in U.S.
Congratulations, California. The top three cities with the worst roads are all from the Golden State. The nonprofit organization TRIP, which researches transportation issues, released a report on Wednesday listing the country’s roughest roads. California drivers probably are not surprised by the findings, which state that the top three worst areas in the nation for rough roads comes from our state. The San Francisco Oakland area – congrats to you, you’re No. 1. According to the report, 71 percent of the roads there are in bad shape. With light rail, high speed rail, and possibly passenger drones and hyperloop pods just around the corner, it’s easy to forget that the most versatile mode of transportation remains the common road. Able to accommodate anything with wheels, from bicycles and wheelchairs to articulated buses and 80 ton trucks, and ranging from dirt tracks to super highways, roads still deliver the vast majority of passenger miles. As vehicles continue to evolve, roads will need to evolve apace. Roads of the future will need to be able to accommodate high speed autonomous vehicles. They will also need to be smart, interacting with individual vehicles to safely enable higher traffic densities at higher speeds. But can California build roads competitively? How expensive are road construction and maintenance costs in California compared with other states in the U.S.? How can California make the most efficient use of its public transportation funds? The Federal Highway Administration maintains a cost/benefit model called “HERS” (Highway Economic Requirements System) which they use to evaluate highway construction and highway improvement projects. One of the products of HERS is the FHWA’s most recent summary of road construction costs, updated in 2015. Its findings reveal both the complexity facing any cost analysis as well as the wide range of results for similar projects. To make a long story short, and to state the obvious, “cost per lane mile” is never one number. The FHWA’s HERS table, which itself is a reductive, arguably arbitrary summary, there are 252 distinct cost per lane mile estimates, 24 per project category. And within these nine categories, the range of costs is dramatic. According to the HERS analysis, adding a new lane to an interstate on flat terrain in a rural area costs $2.7 million per lane mile. To do the same thing in a major urbanized area costs $62.4 million per lane mile, more than twenty times as much. Even minor projects display wide ranges in cost. Resurfacing an existing lane of a principal arterial in a flat, rural area costs $279,000 per lane mile. To do the same in a major urbanized area costs $825,000 per lane mile, three times as much. The fact that topography, existing usage and population density affect road construction costs isn’t news. But the wide variation in costs that result from these physical variables compounds the other major factor affecting road construction costs, which is the political and economic environment of the states where projects occur. As will be seen, the FHWA compiles state by state data on road construction. This data, however, is apparently not sufficient to allow the FHWA to produce a HERS summary showing costs per lane mile by state. The FHWA Office of Highway Policy Administration does issue a highway statistics report, updated annually, that provides valuable per state data on highway mileage and transportation budgets. Their 2016 report is available but incomplete (still missing key tables such as “Disbursements by States for Highways”) so the 2015 report is still the most current. These tables are uniformly formatted and downloadable. An excellent analysis of FHWA data is produced every year by the Reason Foundation. Earlier this year they released “23rd Annual Highway Report,”ranking each state’s highway system in 11 categories, including highway spending, pavement and bridge conditions, traffic congestion, and fatality rates.” Highlights from this study can offer insights into how efficiently California is spending its highway dollars compared to other states through using the following logic: How does California rank in terms of how much it spends per mile, compared to how California ranks in terms of the condition of its roads. There’s not too much you can conclude from that in terms of efficient use of funds. Among the 50 states, California appears to be at or near the bottom 10% in spending per mile of road, and also in pavement condition. In terms of cost-efficiency, among all states, this data suggests California is in the middle of the pack. How Centralized Are California’s Road and Highway Agencies? Within the FHWA data an interesting finding is the great variation between states in road mileage under state administration vs. road mileage under other administration – mostly cities and counties, but also federal. Only a few states, mostly the larger western states, have any significant mileage administered directly by the federal government – Alaska 14%, Arizona 22%, Idaho 16%, Montana 16%, New Mexico 16%, Oregon 28% and Washington 11%, and Wyoming 13%. Most all other states have low single digit percentages of roads administered by the federal government. The national average is 3%. California, only 6%. State administration of road construction is higher, but still relatively low. The national average is 19% of road mileage administered by state agencies. California’s is significantly lower than average, at only 8%. Altogether, nationally, 78% of road mileage is administered by local agencies, mostly cities and counties. In California, 87% of road mileage is administered locally. Before inferring too much from this fact, that road construction and administration is overwhelmingly ran by local agencies, FHWA funding data is useful. The data shows that total funding for roads in California in 2015 was $19.0 billion. Of that, 44% ($8.3 billion) was for “Capital Outlay,” which refers to new roads, new lanes on existing roads, new bridges, and bridge upgrades. The national average is 47% of all road spending on capital. More to the point, the CalTrans budget in 2015 was $10.5 billion. According to the California Office of Legislative Analyst, that “includes $3.9 billion for capital outlay, $2 billion for local assistance, 1.8 billion for highway maintenance and operations, and $1.7 billion to provide the support necessary to deliver capital highway projects. How much of that was reported to the FHWA as part of the total $8.3 billion spent on capital? Certainly the $3.9 billion “for capital outlay.” Probably the “$1.7 billion to provide the support necessary to deliver capital highway projects”? What about the $2.0 billion of local assistance? For capital projects, it appears that between $5.6 billion and $7.6 billion of the total spending of $8.3 billion came from CalTrans. The State of California’s role in total spending on road transportation is also reflected in the budget allocations in that year for the California Highway Patrol, $2.4 billion, which is included in the FHWA’s total for California, under “Law Enforcement” ($3.4 billion). It is possible, if not likely, that the state’s $1.1 billion for the Dept. of Motor Vehicles is included either in the Law Enforcement or Administration categories in the FHWA data, or allocated between them. Finally, the finance charges – interest payments and debt retirement totaling $1.5 billion – are not coming out of the budgets for the state’s transportation agencies, but some percentage of that total is paid by the state. Altogether it is likely that the State of California directly funded about $12 billion, roughly 63% of the $19 billion spent on road construction and administration in 2015. Based on funding data, state agencies clearly play a central role in constructing and maintaining California’s roads. An interesting alternative way to get at how efficiently California uses its public transportation funds is to evaluate based on the expanded variables of total lane-miles instead of state administered road mileage, and total spending on roads by all public transportation agencies instead of just Caltrans. The rationale for using lane-miles relies on the assumption that it is more costly to build a mile of six lane highway (three lanes in each direction) than a mile of two lane road, meaning that lane miles provides a more meaningful denominator, if the numerator is total public spending on roads. The rationale for examining spending by all public transportation agencies relies on the assumption that many, if not most of the political and economic factors that govern road construction costs in California are common throughout the state, having the same effect on construction costs regardless of the funding source. Using FHWA data on lane miles and total spending by state to calculate spending per lane-mile, California was found to average $43,999 in total spending per lane-mile. This ranks California 42 among all states. The national average is $25,474 in transportation spending per lane-mile. Put another way, for every dollar that, on average, is spent to build and maintain a lane-mile in the nation as a whole, California spends $1.73. This suggests that California is not spending its transportation funds nearly as efficiently as the most other states, but without considering other variables this is a misleading statistic. The idea that road construction costs more in urban areas can be attributed to several interrelated factors: Land values are typically greater in densely populated areas. Construction challenges are greater in urban areas where it is more likely that existing structures may have to be acquired and demolished to permit road construction or widening. Labor costs are typically higher in urban areas. Urbanized regions also are likely to have more local restrictions on development, leading to more costly permitting processes and higher fees. There are other key factors influencing road construction costs – for example, climate and topography – but urbanization is easily quantifiable and likely the most significant of them. For this reason, the following chart includes not only spending per lane-mile by state, but also includes the percentage of lane-miles, by state, that are in urban areas. Here, California distinguishes itself as one of the most urbanized states, having 59% of its lane-miles within urban areas. The national average, by contrast, is almost half that; only 31% of the nation’s lane miles are located in urban areas. Tracking these two rankings, spending per lane-mile and percentage of urban lane miles, permits an illuminating comparison. If one assumes there is a correlation between cost per lane mile and percentage of lane miles in urban areas, then how a state ranks in one should be similar to the how it ranks in the other. Six states conform exactly to this assumption. Utah, for example, is the 24th most expensive state to construct roads per lane-mile, and it has the 24th most rural percentage of roads. Similarly, Illinois has a $/mile rank of 34, and it has a rural road % rank of 34. Texas, Pennsylvania, New Jersey, and the District of Colombia all have $/mile rankings exactly equal to their rural road % ranking. Five more states have a deviation between their $/mile rank and their rural road % rank of only one. California’s is only two – it is ranked 42 in its cost per lane mile, making it quite expensive relative to most states, but it is ranked 44th in its percentage of lane-miles in rural areas, meaning it is one of the most urbanized states. 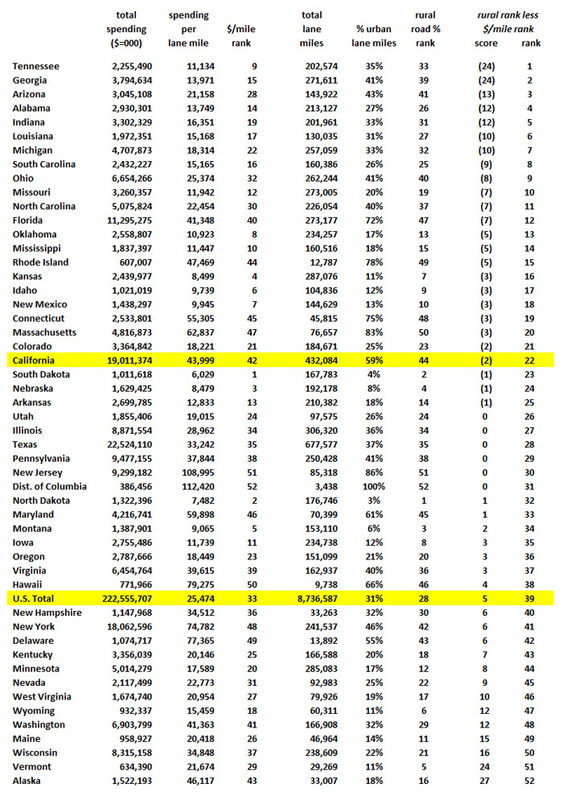 The final set of columns on the chart, on the right, show a score for each state based on the rural road percent ranking less the $/mile ranking. If the score is negative, that means the state spending on lane miles ranks better (less per mile) than its rank based on its percentage of rural lane-miles. In other words if the score is negative, that means the state is spending less per lane mile than one might expect based on their level of urbanization, and if the score is positive, the state is spending more per lane mile than one might expect based on their level of urbanization. Once again, California is in the middle of the pack. If one assigns any credence to these rankings, it presents interesting questions. Why is it that states like Georgia and Tennessee, which are relatively urbanized, are among the top performers in terms of being able to cost-effectively construct and maintain their roads? In the case of Tennessee, it isn’t as if they’ve neglected their roads, they are in the top ten in all three FHWA measurements of pavement condition. Georgia’s scores on pavement condition put them in the middle among states. In some of the poorly ranked states, topography and climate may be factors. Alaska, the one of the least urbanized states nonetheless is one of the most expensive states to build and maintain roads, which should come as no surprise. Most of the states with low scores have harsh climates. A final note regarding California – while it shows a high correlation between its cost per lane-mile and its level of urbanization, it does not score well in the three pavement condition indexes; 33 out of 50 for rural interstates, 45 out of 50 for urban interstates, and 46 out of 50 for rural arterial roads. Federal data indicates that while California scores poorly compared to other states in terms of road conditions, California also spends less than other states in terms of expenditures per lane mile. Considered in isolation, those two facts only suggest that California is using its transportation funds no more and no less efficiently than the average state. While federal data also indicates that California, overall, spends nearly twice as much per lane-mile as the national average, California is also more heavily urbanized, and normalizing for that reveals again that California is being roughly as cost effective in its use of transportation dollars as the average state. When factoring in the condition of California’s roads, however, which are near the bottom in pavement condition indexes, California is not using its transportation dollars as well as it could. Anecdotally, literally everyone surveyed – and we talked with representatives from dozens of agencies, research firms, and transportation agencies – agreed that per mile road construction costs are higher in California than most other states. But the federal data we had access to does not offer documentary proof of that, and Caltrans, despite numerous attempts, could not produce data on per mile construction costs that could be compared to national averages. By maintaining permanent engineering staff instead of contracting, whenever projects are concluded these engineers are often idle until another project comes along. The Legislative Analyst’s Office in 2015 reported that there were 3,500 of these positions created for programs that have expired, requiring an extra $500 million each year. Immediately increase the ratio of contracted work from 10% to 20%. Permit the headcount of in-house engineers at Caltrans to reduce through retirements and voluntary departures, systematically increasing the ratio of contracted work as the number of Caltrans in-house engineers decreases. Set a goal of at least 50% contracted work within five years. Abolish the current requirement that the state legislature has to approve any projects that are contracted by Caltrans instead of designed in-house. How can California use public transportation dollars to nurture innovation that will deliver more people to more places, faster, safely, for less money? One way would be to nurture competition by nearly eliminating Caltrans. Why should one state agency control nearly two-thirds of the funds for road construction and maintenance in California? Why not reduce Caltrans to a couple dozen administrators to handle federal regulations and direct federal funds and move all road work, expansion and maintenance to the counties? The counties can conform to a general state plan, but there’s no reason to have a state bureaucracy any more when the counties can be challenged to be more efficient, effective and non-duplicative in their work. Imagine the innovation that might come out of Santa Clara County, where stretches of roadway could be immediately prioritized to add smart lanes where autonomous cars – including mini-buses and share cars – can operate safely at much higher densities and speeds. Imagine the innovation that might come out of Los Angeles County, where entire transit corridors could have congestion greatly relieved because thousands of cars are being swiftly and safely transported from point to point in underground tunnels. Imagine the innovation that might come out of San Francisco, where congestion pricing completely eliminates their chronic gridlock, or out of Orange County, where private investors team up with public agencies to use roboticized equipment to perform heavy road construction at a fraction of the cost for conventional processes? Why not decentralize transportation management in California and turn the counties into laboratories of innovation? It is an accident of history that California is so densely urbanized. Most metropolitan regions on the east coast, developed gradually over three centuries or more, have thousands of square miles of spacious suburbs, and tens of thousands of even more spacious expanses of moderately settled lands on the edges of remaining wilderness areas. California, in stark contrast, has nearly 18 million people residing in greater Los Angeles and over 7 million people residing in the greater San Francisco Bay Area. If you add residents of the San Diego region and Sacramento regions, you account for 32 million out of a population of 39 million. And yet all of California’s urban areas, the most densely urbanized in the nation, only constitute five percent of its 163,696 square miles! The math is compelling – you could settle ten million people in four person households on half-acre lots and it would only consume 1,953 miles. Double that for roads, parks, commercial and industrial space, and you are still only talking about urbanizing another 2.4% of California’s land. The idea that we cannot do this is preposterous. The cost of infrastructure, roads in particular, is much higher in urban areas. So why not expand along the nearly empty Interstate 5 corridor, creating new towns and cities that are spacious and zoned to never become congested? Why not upgrade I-5 to accommodate high speed smart vehicles that provide nearly the speed of high-speed rail, while preserving the point-to-point convenience that only a car can offer? Why not expand along the entire fringe of California’s great Central Valley, where currently thousands of square miles of cattle rangeland are being taken out of production anyway? Why not build more roads on this raw land, bringing down the cost both for roads and the homes that will be built around them? California’s policymakers have adhered increasingly to a philosophy of limits. Urban containment. Densification. Less energy use. Less water consumption. Fewer cars and more mass transit. But it isn’t working. It isn’t working because California has the highest cost of living in the nation. Using less energy and water never rewards consumers, because the water and energy never were the primary cost within their utility bills – the cost of the infrastructure and overhead was the primary cost, and those costs only go up with renewables. Cramming home construction into limited areas not only destroys the ambiance of existing neighborhoods, but simply cannot increase the supply of homes enough to lower the cost. There is a completely different approach that would cost less and improve the quality of life for all Californians. Without abandoning but merely scaling back the ambition of new conservation and efficiency mandates, free up funds to build safe, generation III+ advanced nuclear reactors. At the same time, construct desalination plants on the Southern California coast, enough of them to supply the entire Los Angeles basin with fresh water. Instead of mandating water rationing for households, put the money that would have been necessary to retrofit all those homes into new ways to reuse water and capture storm runoff. Paying for all of this wouldn’t have to rely exclusively on public funds. Private sector investment could fund most of the energy and water infrastructure. Water supplies could be even more easily balanced by permitting water markets where farmers could sell their water allotments without losing their grandfathered water rights. If the permit process and mandated design requirements were reduced, builders could carpet former cattle ranches with new homes, sold for a profit at affordable prices. This is the final segment of a four part excursion into California’s transportation future. In each section the same themes emerged: It isn’t just what gets built to serve future Californians, it’s how cost effectively the money is spent. Innovation and regulatory reform – CEQA in particular, but also repealing SB 375, AB 32, and related anti-growth legislation – together have the potential to lower the cost of infrastructure, transportation in particular, by at least 50%. California’s current policies have stifled innovation and created artificial scarcity of literally every primary necessity – housing, energy, water and transportation. Each year, to comply with legislative mandates, California’s taxpayers are turning over billions of dollars to attorneys, consultants and bureaucrats, instead of paying engineers and heavy equipment operators to actually build things. The innovation that persists despite California’s unwelcoming policy environment is inspiring. Right here are the pioneering companies that will deliver flying cars, commercial access to outer space, breakthrough modes of transportation such as hyperloop and urban tunnels. Right here are the companies that will deliver self-driving cars, cars on demand, high-speed smart cars. These things will happen within a time frame that is, by the standards of human history, breathtakingly short. And with the right assortment of pro-growth policies in place, more of them will happen right here. California’s transportation future cannot be predicted with any certainty. If the past few decades have taught us anything, it is that innovation routinely delivers products and solutions that nobody could have possibly imagined. But it is a reasonably safe bet that the common road is the most useful mode of transportation infrastructure for which public policy can risk public funds. A flat surface where wheeled conveyances of every conceivable design can all travel from point to point, clean, smart, versatile, sustainable, and fast. Edward Ring co-founded the California Policy Center in 2010 and served as its first president. Using dedicated lanes for high speed vehicular travel has been tried already. The fast lanes on the German autobahns easily qualify. If you’re driving 120 MPH in the fast lane on the autobahn, you’d better watch your rear view mirror, because if a car traveling 160 MPH crashes into your rear end, it’s your fault. German drivers obey strict rules, the most critical of which is slower drivers must always yield to faster drivers by moving promptly into the left lanes, and faster drivers must never pass on the right. And it works. The fatality rate on the autobahn is much lower than on the United States interstate system. Private entities supported by industry are funding this effort and working closely with the U.S. Dept. of Transportation as well as with most states. Just a few of the major organizations involved in this effort include the International Organization for Standardization (ISO), ASTM International, SAE International, Institute of Electrical and Electronics Engineers (IEEE), National Transportation Communications for Intelligent Transportation System Protocol(NTCIP), American National Standards Institute (ANSI), European Committee for Standardization (CEN), European Committee for Electrotechnical Standardization (CENELEC), and the European Telecommunications Institute(ETSI). The next installment in this series will explore the implications of this assertion. What would it take to improve productivity in the heavy road construction industry? There has been a healthy public discussion regarding how much it will cost to build California’s high speed railroad. But how much would it cost to build roads in California? How much would it cost not only to catch up on all the deferred maintenance on California’s roads, and upgrade them incrementally, but to actually build new roads, north to south and coast to mountains, engineered for the cars of the future? Fuel prices in California are among the highest in the country, as a result of some of the highest taxes in the country, plus the costs associated with compliance with various State environmental laws, which trickle down to the consumer, resulting in Californian’s paying as much as $1 more per gallon than most folks in the country. A bill currently working its way through Sacramento is SB 1074 (Moorlach) “Transparency in fuel taxes”. Most everything that is bought, from clothes, computers, vehicles, etc., are based on price plus tax, except one item – transportation fuels, as the posted price includes everything. Case in point was SB1 for Transportation Infrastructure funding that is targeted to raise $52 billion for infrastructure projects, added 12 cents to gasoline and 20 cents to diesel on November 1, 2016. With California already having some of the highest fuel taxes in the nation, the cost of those fuels did not change last November, but the posted price at the pump did change, but was not transparent to the public as to why fuel prices went up. Low Carbon Fuel Standard (LCFS) compliance is getting tougher to meet each year as well as more costly each year. Today, the California Energy Commission (CEC) shows that the LCFS adds 10.1 cents per gallon for gasoline, and 6.8 cents for diesel. Those costs trickle down to the consumer and are hidden within the posted price of fuel at the pump. The CEC also shows that Fuels Under the Cap (FUTC) i.e., the “boutique” fuel standards for gasoline and diesel required by the Federal Clean Air Act and the California Air Resources Board (CARB) to meet the state’s fuel blending requirements for reformulated gasoline standards accounts for 11.9 cents per gallon for gasoline, and 14.5 cents for diesel. Again, those costs trickle down to the consumer and are hidden within the posted price of fuel at the pump. Cap & Trade revenues are funding the High Speed Bullet train as well as many other “green” projects. Within numerous state government agencies, there is a feeding frenzy on getting a piece of those lucrative cap and trade “fee” revenues for their projects. Again, those costs trickle down to the consumer and are hidden within the posted price of fuel at the pump. The CEC shows that California fuel consumption is at the highest level since 2007. Fuels consumption for California’s 35 million registered vehicles in 2016, of which more than 90% were not EV’s, was 52 million gallons per DAY of gasoline and diesel. Sounds like a lot of fuel, but it’s only about 1 plus gallons per day per vehicle, resulting in refueling requirements every week or two. With numerous incentives, 50% of the EVs in the nation are in one state-California, but they only represent about 7% of the 35 million registered vehicles. With the other 49 states accounting for the other 50%, it appears that nationwide, they are not endeavored by the EVs. On a go forward basis, internal combustion engines appears to be the choice of citizens. The California economy is heavily driven by affordable transportation. Yet, Californians pay more per gallon of gasoline and diesel due to costs that are not transparent to the public. A Yes vote on SB 1074 would expand transparency at the pump by creating a Quick Read (QR) Code that directly links the consumer with updated costs of taxes and regulated costs associated with the production of each gallon of fuel purchased would demonstrate that our elected representatives favor transparency of the costs that are included on the posted prices for fuel at the pumps to show the public why Californians are paying as much as $1 more per gallon than the rest of the nation. On the contrary, a No vote on SB 1074 would demonstrate that our elected officials do not want the public to know why our fuel costs are among the most expensive in the country. SACRAMENTO — After a year of stalled negotiations on a multi-billion dollar transportation plan, Democratic legislative leaders are privately discussing reconvening the state Legislature after the Nov. 8 election to take up road funding in a special session, legislative sources said. In a lobbying effort supported by Assembly Speaker Anthony Rendon and Senate President Pro Tem Kevin de León, state Sen. Jim Beall and Assemblyman Jim Frazier, chairman of the chamber’s Transportation Committee, have reached out to colleagues in recent days to seek support for a transportation bill. Much like much of the state’s traffic, the legislative special session on transportation/infrastructure is stuck in gridlock. Democratic legislators have a plan to provide $7.5 billion a year in new tax revenue. The governor’s plan also includes tax increases. Republicans want to use current tax revenue more efficiently, cap and trade funds for roads or direct some of the road related monies like truck weight fees directly into road improvements. Neither side budges. Could this gridlock be altered by the results of November’s elections? If the Democrats secure the two-thirds majority that would allow them to raise taxes without Republican support, then its game over, right? The Democrats will pass a tax increase and the governor will sign it. While many Democrats are happy to blame the Republicans for the gridlock over the special session because the GOP won’t okay taxes, the scolding Democrats conveniently overlook a good portion of their own caucus, which is wary of raising gasoline taxes on constituents. Recall that the piece dropped from the controversial SB 350 last year had to do with cutting gasoline use, which in turn would have increased gas prices, something Democrats particularly representing poorer or inner valley areas of the state did not want to do. Raising gas taxes will also add to the cost of gasoline. Given the demands of voters to relieve gridlock on roads, the advocacy of the business community to spark the economy with a better transportation system, and the support of labor forces to get good construction jobs, you would think a compromise would be attainable. But environmentalists and public unions don’t want to give on CEQA reform or restructuring CalTrans as some Republicans have suggested, and Republican legislators are concerned about a backlash if they raise taxes. In the meantime, there are discussions about the possibility of a ballot initiative backed by the business community modeled after the school-funding plan, Proposition 98, which would dedicate money to transportation infrastructure and the roads. If nothing comes out of the special session soon, other forces could attempt to deal with this crucial issue.